Nelle and Alice were excited because they were going camping in the woods. After a long drive, they reached a place called a quarry with a lake, trees, and baby fawns. The place was peaceful and the air was fresh. They could hear their echoes when they shouted. There were no sounds of screeching cars and roaring sirens like in the city. Nelle and Alice were happy to be out of their car seat and to run and skip along the path. They excitedly pitched their tent, and were happy to sleep beneath the starry sky with the stars, moon, and fireflies for company. They made their own food and walked on trails, discovering the beauty of nature. 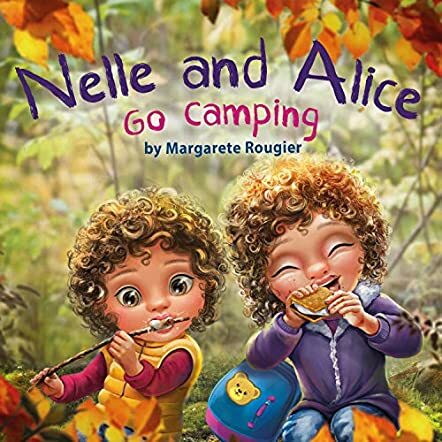 Nelle and Alice Go Camping by Margarete Rougier is the second book in the series. Margarete Rougier takes readers closer to nature to let them experience the raw and natural beauty that exists there. The illustrations are so bright and lively that the characters and the charm of the quarry come vividly to life for young readers. Alice's and Nelle's experiences at the quarry will encourage readers to go on a camping trip like them and feel at one with nature. It is a good bedtime storytelling book, and can be used in classrooms for read aloud sessions. It is the best way to make children realize the enigmatic beauty of nature in a fun way. Reading this story will also enable readers to learn new words and enhance their vocabulary.